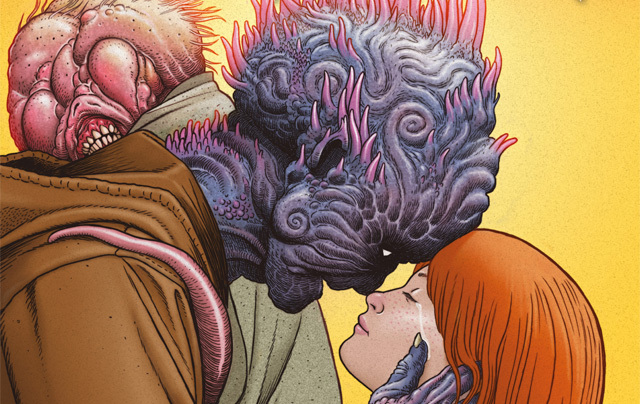 Titan Comics: SURFACE TENSION #4 Review | Warped Factor - Words in the Key of Geek. 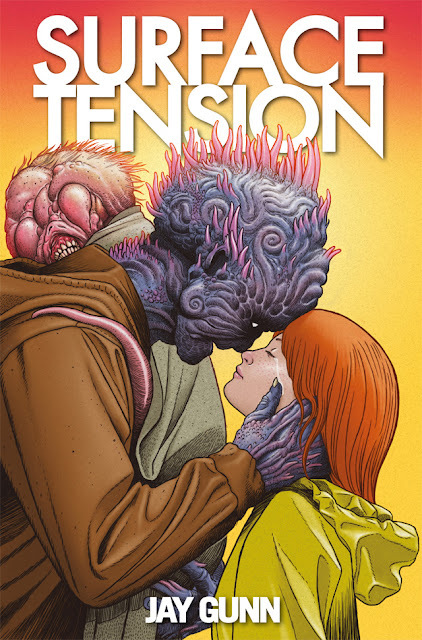 Gail Williams finds a lot to like in issue #4 of Surface Tension. As Meg and Kyle continue to diverge from their human appearance, they take the reader through a series of revelations. Mary leads Meg back to the time the Sea Sickness began, when their friends and relations were heading into the sea. The siren call of the sea is shown, how it draws its victims in, and more importantly, why. Meanwhile, Jean and Shariq are still fighting the monster on the shore, the monster might be looking for Gravinsky to purge, but Jean seems to be looking for a heroes end. At the end of the last issue we saw Shauna and Kyle heading away from safety in search of Kyle’s little brother Ryan. On the way they make a discovery that I thought was obvious from the start, the Selkies used to be human. What they discover when they find Ryan, was equally predictable. What was less predictable, in fact came out of the blue to me, was the events, the family actions, reactions, the misdeeds that led up to Kyle’s entry to the sea, the chance that lead to his return with Meg, the love that was always the glue keeping this family together. Eric, Meg’s missed opportunity of a boyfriend is seen again, and it is through him that the real denouement comes. As Erik’s true motivations are shown, he tells of the Plasmoids… but if you want to find out more, you’ll just have to read the issue. Issue #4 answers a lot of questions that were set up through the previous issues, story wise it’s moving on nicely. Issue #3 waned a little because it was all questions, no answers, but now it is possible to see why that was the case. What continues to impress with this comic is the artwork. The monster Jean and Shariq fight is beautifully ugly, proportionally misshapen. Most impressive are the dreamlike sequences when we go inside the coral with Meg and interact with her mysterious helper. When it comes to scoring this one, the temptation is to go for a five, but I’m oddly reluctant to do that, the issue nudges closer and closer to that illusive five from me, but something tells me that the writers and artists have more to give, and the five is on hold till I see what they really have to offer.